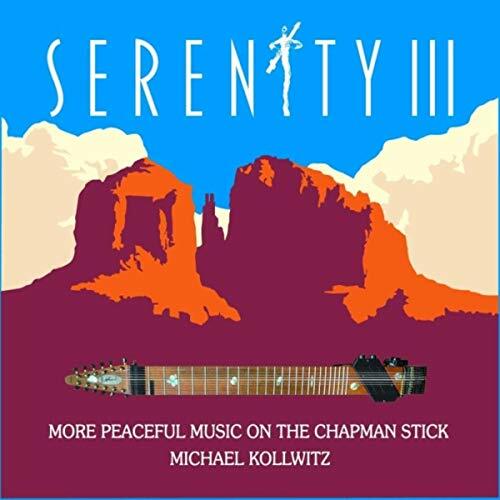 Michael Kollwitz is a lifelong master of The Chapman Stick, a unique stringed instrument created by Emmet Chapman that resembles the head and neck of a guitar but is played more like a piano. The third installment in his soothing Serenity trilogy, Serenity III is comprised of sixteen balmy passages that are comfy, cozy and beautifully pristine. Having formerly resided in Sacramento, CA before relocating to Hawaii in 2007 until eventually settling in Sedona, AZ, Kollwitz seemingly infuses a part of each of these beautiful locations into the essence of his work, with his pieces often evoking a vast range of scenic beauty stretching from the red rocks to the blue Pacific. Warmly melodic and deeply tranquil, additional textural threads and tones all produced on The Chapman Stick are subtly woven into the compositions, effectively casting them with a dimly-lit ambience and creating additional depth to get lost in. Not surprisingly, the album’s song titles are mostly inspired by natural landscapes, reflective moods and positive states of mind, which is exemplified on beautiful pieces such as “Smooth Sailing”, “Winding Down”, “Crystal Caves” and “Forgive and Forget”. Debuting in the top five of the Billboard New Age Chart, Serenity III just might be the best album yet in Kollwitz’ mesmerizing Serenity series. Like it’s two predecessors, this album will transport the listener to a leisurely paradise wherein all of one’s troubles are left far behind. Although adept at creating peaceful musical environments that encourage feelings of wellbeing and personal contentment, Kollwitz clearly manages to avoid falling into predictably cliché “new age” traps, nor could his thoughtful compositions ever be relegated to mere background music. Rather, Kollwitz' style is expressively unselfconscious, yet down-to-earth and refreshingly humble in approach.